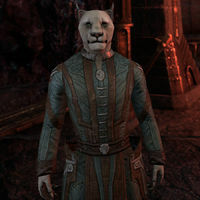 Zur is a Khajiit alchemist who was the victim of Daedric experiments in the Vile Laboratory which merged his soul with that of Gadris, a Dunmer mage. As the soul-meld will eventually kill them both, they are looking for help. Since the pair are quite different they do not have a harmonious relationship. While speaking with Gadris and agreeing to help them, Zur will suddenly come to the fore and introduce himself. "Ah, to see out of Khajiit eyes again! Zur hates being caged in that dark place." You must be the alchemist. "Yes. This one is pretty famous. Perhaps you have heard of Zur? But Zur must tell you. This soul-meld is killing us. Will you help us? Will you unmeld our souls?" "Unmeld is so too a word! Pardon. The Dwarven device that caused this is inside the laboratory, but rubble blocks the way. Collect Zur's notes and a bottle of pearl tincture. With those, this one can make a potion that will get you past the rubble." I'll find your notes and the tincture, but I have a few questions. "Questions are good. Ask and ask again. That is the systematic method of experimentation! Remember that you must know the rules before you can successfully break them." What kind of potion will get me past the rubble? "Zur's specialty is transmutation. Change one thing into another. So. Not too difficult to change you from large to small. Then you can slip past the obstacles that block the entrance. Zur never said it would be easy, Dark Elf. Mind your tongue!" Were you part of the expedition to Coldharbour? "Oh, yes! We came to defeat the evil Molag Bal! Or was it Mannimarco? Zur forgets. So many bad things start with the letter "m." But something went wrong and Gadris and this one ended up here. That's when the Daedra melded our souls." "Unfortunately, no. The soul-meld weakens us, and we must conserve our strength. With the recipe and the ingredients, this one can make a transmutation potion and exert almost no energy whatsoever. A much better approach at this time, yes?" While searching for the missing papers and the tincture, Zur will suddenly appear once you enter the building containing the potion. Zur: "Pssst. Over here. This one used an illusion spell. Very little effort." You have the option of speaking with him. "Zur has found you! This one is so happy now." "Zur thought this was where he left the tincture, so I came to investigate. Don't tell Gadris that Zur was here. A simple illusion spell protected me, but Gadris gets worried. Me? I like to explore!" It must be strange sharing your body with someone else. "This one has always enjoyed trying new and different things. But this situation? It is very strange, very awkward. Is that thought me-Zur or me-Gadris? This one can never be certain where his thoughts end and Gadris's begin. Very confusing, yes?" Once you enter the Vile Laboratory complex, the mage will appear from hiding and shift from Gadris' form. Zur: "Zur told you our friend would find us, Gadris. You worry too much." You can then speak with him to hand over the collected materials. "Gadris is upset because we had to hide behind some rocks. Undignified, he said. Well, Zur says that being eaten by a deformed creature is even more undignified." I have the things you asked for. "Quiet, Gadris! This one knows what he's doing. This is most fragrant work, my friend. Most fragrant! Zur shall draft the potion immediately. It should make you slightly smaller. Certainly small enough to squeeze through the rubble." How long will I remain small? "Long enough to slip into the laboratory. A few minutes, give or take. Now, let Zur think. Was it six or seven drops of tincture?" Zur will then head over to a nearby table to make the potion. Zur: "Zur thinks he saw some dried scathecraw over here … yes, here it is!" Once he has made the potion. After you have entered the main laboratory and gathered the materials needed to forge antipodal rods, Zur will teleport in. Zur: "Gadris' teleport spell worked! This one is here! Be careful, friend. The Dwarven constructs have awakened." You can then speak with him. "Zur hates standing in the green goo. No amount of licking gets it out of one's fur." "Gadris worries so much. He wanted to make sure you found the catalyst. The catalyst makes the rods strong enough to withstand both magicka and machinery. Two things this one likes very much." "The basic ingredients can be melted, but without a catalyst to imbue them with strength and elemental—alchemy is not boring, Gadris! Oh, very well. Gadris wrote about a proper catalyst for the antipodal rods. He wants you to read his notes." How were you and Gadris able to work in here? "After the soul-meld, the Overseer ignored us. The Dwarven constructs were inactive, so we were able to work here in relative peace. Yes, Gadris, everything was fine until Zur exploded something. The Dark Elf sure knows how to hold a grudge." "Many things! The last one was pretty spectacular. It was an accident, of course. Gadris was so mad because we were forced outside. But it proved his first suggestion for a catalyst didn't work. So … the experiment was successful." After forging the antipodal rods and speaking with Gadris outside the Overseer's atelier, Zur will come forth to say some words before the splitting takes place. "The Overseer's in there. He put us into this Dwarven machine. He's dangerous." "Do not worry. This one is not afraid. The process can be reversed. Our research tells us this. Zur is optimistic. And if I die, then it is just on to another adventure, yes?" If it comes down to my decision, which one of you should I choose? "We are very different. Zur has learned much sharing a Dark Elf's mind. Few Khajiit experience such a wonder, yes? Gadris will do many great things, provided the unmelding works, and so will Zur. But this one would never choose himself over another." "Sound theoretical extrapolations are what Gadris excels at. And this one's experiments support his research. We believe the device can be forced to unmeld our souls. In any event, we won't survive the soul-meld. At the very least, we must try." Anything I need to know about the next room? "What's that? Yes, Zur will pass that along. Now quiet, please. The Overseer's in there. He put us into this Dwarven machine. He's dangerous. Many of the constructs that roam this place are under his control. Gadris recommends killing him quickly." Zur will be waiting for you at the machine. "This one can't believe you crossed this chamber without so much as an illusion to mask your presence. You are so brave! This one? Zur's whiskers were twitching inside the Dark Elf's head!" "Next comes the exciting part! You test our theory! See those two pillars? One represents Zur, the other Gadris. Insert the antipodal rods and turn on the device. If it works, you should be able to separate our melded souls." But I can only restore one of you? "Yes, as we have explained. One body, one soul. At least one of us will survive to help the Mages Guild. This one knows you will make the right decision." Zur: "Place the Crystal into the machine. Then insert an antipodal rod into each pillar to start the unmelding process." Once you have inserted the rods into the machine, the two souls will leave the body and take their place on opposite sides. Zur: "Please … hurry … one of us must be saved …." You will now have to choose who to save. If you chose Zur, you can approach him once his soul is back in his body. "How strange this feels! To be simply Zur again is … lonely." "Zur is Zur, but something is missing. This one's soul feels … emptier, somehow. Before our meld, Zur thought Gadris was stiff and nasty. But I know better now. Gadris was brave and selfless. A true friend and a great mage. He will be missed." I'll get the crystal and meet you outside. "We must leave this place. But first, the crystal that powers the device. It is one of the fabled Lights of Meridia, yes? You should take it. This one thinks it will be useful later on. Zur will teleport outside and wait for you somewhere safe." After you grab the Light of Meridia and leave, Zur will be waiting for you outside. "Zur's mind feels empty … silent. I miss Gadris already." "During our time together, we determined that the Dwarven device operates on the same principles as Molag Bal's Planemeld. Zur will honor the Dark Elf's memory and give him credit for this discovery. Thank you again for saving us, my friend." Once you have a completed the quest, Zur will open a portal to the Hollow City. Zur: "This one is strong enough to open a portal now. We shall go to this Hollow City Zur has heard so much about." Zur: "The portal shall remain open for only a few minutes, my friend. Zur hopes to see you again in the Hollow City." If Zur was the one saved when he and Gadris split, he will be in the Dark Alchemy Lab in the Hollow City. "Ah, it is my most pleasant and clever friend. Zur is happy to see you again! This Hollow City, it is nice, yes? Gadris would have liked this place. I learned much from our time together. Zur keeps better notes, now. Very neat. Less doodles." Zur will attend the War Council held in the Chapel of Light. "If this one wasn't shaking in his fur at the thought of facing Molag Bal, I would find this gathering to be extremely fascinating!" This page was last modified on 7 March 2019, at 20:54.